I think Francis Manapul has the right idea with Trinity Vol. 1: Better Together. Given that a teaming of Superman, Batman, and Wonder Woman isn't such a unique thing any more, with the three regularly appearing in each others' titles (including Batman, which used to be more rare), Manapul focuses on quality, not quantity. He takes the three on an emotional journey that, rather than the typical approach of comparing and contrasting the characters, instead revisits past moments that simply makes them individually vulnerable to one another, and in that way builds a bond between Wonder Woman, Batman, and the new Superman from a different reality. But the first volume of Trinity does not come together well, despite Manapul's efforts. I credit Manapul again for looking inward instead of outward, but the effect is ponderous. Depictions of these characters' origins are so ubiquitous these days that spending three issues on some of these characters already most recognizable attributes comes off dull. Manapul probably couldn't have chosen a threat for the heroes other than the one he did, but riffing almost exactly on a well-known story only contributes to the sense we've seen this before. Manapul's art is bar none here, and neither would I complain about Emanuela Lupacchino drawing Wonder Woman especially, but their styles and others in the book don't mesh, making for an overall uneven reading experience. Trinity Vol. 1 will occupy an odd place in history. The very premise of the book, at least at the outset, is that this alt-continuity Lois Lane is making an effort to bring together Wonder Woman, Batman, and her husband Superman so that they can all re-forge the bonds they had with their own universe's analogues. But post-Superman Reborn we know they're all of the same universe again, so the high concept -- Wonder Woman and Batman get to know Superman -- goes away, and this simply becomes a regular team-up book, the descendant of Superman/Batman and Batman/Superman. I wish Trinity could have continued with its original premise longer, as that's more interesting and gives this book more purpose; we've seen both this book's previous iterations go wrong when they stopped being immediately relevant. I'll be curious to see how the next volume of Trinity handles this; it's a weird thing for what your series' first volume tries to accomplish to be made moot as it switches to the second book. I can honestly say I've never seen a teaming of Poison Ivy and Mongul before, so that's an accomplishment on Manapul's part. There was nothing Manapul could do here but riff on "For the Man Who Has Everything," but to send the heroes right back to the dream-world and right back under the spell of the Black Mercy seems riffing too specifically by half. Letting alone that it's hard to figure where Manapul believes he's plucking Mongul out of, since none of this jibes with Mongul's considerable New 52 appearances and the original "Man Who Has Everything" couldn't have happened in this continuity, though Manapul is kind of suggesting it did. Similarly Manapul's Poison Ivy doesn't jibe with a variety of recent appearances, though some will be happy to find that she's fairly similar in attitude and motivations (and connection with the Green) to the recent Amy Chu version. Perhaps the best part of this book is when Manapul does something truly unexpected and has Lois Lane trying to run over Ivy with her truck. Again, I need not delve into Superman, Batman, and Wonder Woman's origins yet again (the issue with the Waynes getting shot, with art by Clay and Seth Mann, is particularly laborious and overwrought). That said, I did appreciate that Manapul side-steps the parallel narrations of Jeph Loeb and Greg Pak and instead just lets the other heroes bear witness to each other's tragedies and triumphs, and in that way come together simply by being vulnerable. Some of the characterizations here feel forced -- that Wonder Woman, at this point in her life, would bring a dead boar to someone's house as a gift, or that Batman is so emotional that another character remarks on it -- but the emotional arc as a whole and how the characters move through it seemed to me to be the most original thing about the story. Manapul's art shines especially in the first chapter, where he offers three parallel splash pages that set the heroes against their own emblems in panel form. Manapul's depiction of pastoral Hamilton County is well-done too, reminiscent of his Adventure Comics work. Lupacchino gets to draw a George Perez-inspired Themyscira, which would be lovely under other circumstances, as well as depicting a teenage Diana who deserves a series of her own. But going from Lupacchino to Manapul is going from a darker, more realistic DC house style to a much lighter touch, and further it feels very overboard when Clay and Seth Mann try to mimic Manapul's artistic paneling. Altogether what might have helped would have been for Manapul to intersperse the book's three dream-storylines and do the same with the art; each artist is perhaps supposed to represent an individual hero but it doesn't quite track and it's jarring overall. 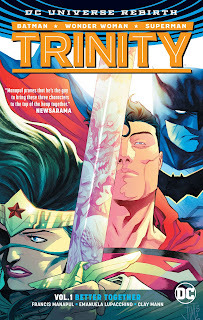 It seems like Francis Manapul is on Trinity for the long haul and as I noted, Trinity Vol. 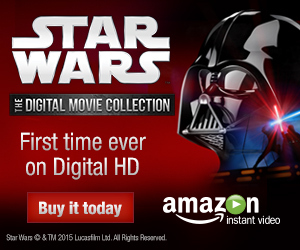 1: Better Together is the wrong book by which to judge this series since it doesn't really reflect the book's set up. But Manapul has a lot of competition for "trinity" stories and so far Trinity doesn't distinguish itself as the one to beat; I'm hoping for more as this series continues.